The London Marathon is 37 years old, same as me. I can remember the first time I heard about it; back in primary school one of the lads in my class brought in his Dad’s medal and foil blanket from the race. I remember us all being really impressed and running round the playground that day thinking about how it would feel to run a marathon. Fast-forward a few years and I’d become a bit cynical about it. I watched every year, admiring the runners and tracking friends, but honestly, I’d was fed up of the annual disappointment of not getting a place. For my first two marathons I trained with others from BvH and travelled and raced on the day with them, first to Manchester then Brighton. I loved that aspect of the marathon… but I couldn’t see what the London fuss was about. I entered the ballot expecting the disappointment again and thinking maybe I’d just get a charity place… and then I got in! Unfortunately almost as soon as I knew I’d got a place, injury struck at the Great Birmingham Run and my training came to a standstill. December saw me back with some short runs but then a virus further delayed my training. Into January I felt like I was starting from scratch and that at best London would be a case of “get round and enjoy the day”. I was really fed up and had some low moments but my teal family got me through. Everyone is so supportive but I have to mention Clare Mullin, Collette Greenhouse and Rachel Partridge (in our own virtual Injury Corner); Rachel Hursey (who did a commando raid on my house to bring me goodies and cheer me up when I felt so ill); Nic Sykes who sent me so many positive vibes over WhatsApp and answered all my stupid questions and everyone else who ran with me (Rebekah, Jude, Steve and all the Sunday crew). Slowly I built the runs back up and somehow made it to London with a decent spell of training, including a couple of 20 mile runs and the feeling that my fitness was coming back. I was excited but calm; knowing that Jude, Suz and Linda had all “been there, done that” with the hotel and travel and looking forward to the whole experience. I absolutely loved the expo; before I loved running I used to love shopping; combine the two and you have a happy Stacey! I met Michael McEwan, author of Running the Smoke; and the ultra-runner Dean Karnazes. I spent some time on the Breast Cancer Now charity stand remembering what had started me running and why I was there. I listened to the experts including Martin Yelling, who I’ve been listening to on Marathon Talk for years and I met two of the organisers of the National Running Show, which is in Birmingham in January. I really hope it’s got the vibe that the marathon expo has, but without having to think about needing to rest my legs! I headed off wanting more but knowing that I needed my energy for Sunday. I met my university friends to start the carb-loading with pizza and to plan where they’d be watching on the course. If there’s one thing I would take away from this experience it is the importance of relaxing as much as possible and enjoying it. 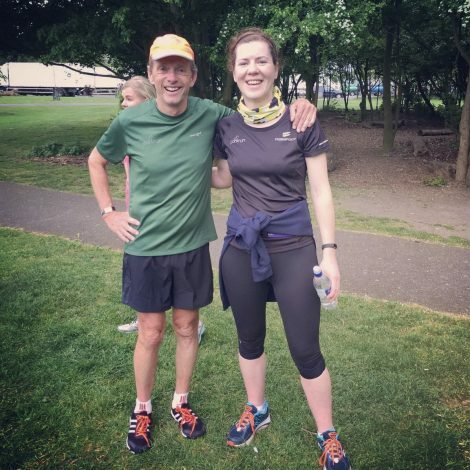 I’d decided to stick to my usual routine with a parkrun on Saturday morning and having done a few of Emma’s local ones, Burgess parkrun was the nearest that we’d not done. Decision made, and it couldn’t have been more perfect. The usual crowd here is small, but it’s a lovely flat course and the marathon had brought out the parkrun tourists. It was announced on the start line that Bruce Fordyce was there! Well, I was in raptures but I also realised that most people had no clue who he was (lots of “Bruce Forsyth?” all around me and looks of disbelief!) For me it was exciting on two counts; I have always dreamed of doing the Comrades Ultra-Marathon, where Bruce Fordyce won 9 times; and also he’s “parkrun royalty”, having started it in South Africa where it’s now enormously popular. I knew I had to keep a nice easy pace but I was really glad when it happened to be about the same as his (pre-marathon) pace. I unashamedly picked his brains about Comrades, and we chatted about the wonders of parkrun. He was such a nice guy and generous with his time… I was absolutely buzzing and couldn’t quite believe my luck! I took the rest of the day as easy as possible, the nerves beginning to kick in, but really it was perfect prep – getting to the hotel early, pinning my number on and all that. 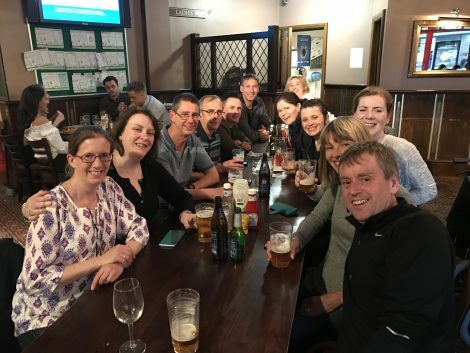 I met the rest of the BvH runners and supporters in the bar before a short walk to the local Wetherspoons for some more carbs and then back to base for an early night… it was all feeling a bit too easy! Race day dawned and I had an “odd” pain in my left quad which I tried to ignore, convinced it was maranoia and if not it was too late to do anything about it. We got to Blackheath and Collette, Linda and I said our goodbyes to the others. The organisation here was better than I’d ever experienced at an event of this size; I managed to use the loos not just once but twice, and handed my bag in with ease. Lin was off to the Championship start and then it was just Collette and me in the pen and raring to go. It was cool but the sun was beginning to peep through the clouds and I congratulated myself on having my cap, sunglasses and factor 50 on! Apparently not everyone was as well prepared. I thought it would take ages to reach the start but was amazed to round the corner and see the starting line which we crossed about 3-4 minutes after the gun. Collette and I were both intending to run at around 9 minute miles (sub-4 hour pace) and just see what happened. I’d been warned that it got very congested at the start but honestly I think it was for the best, I tried to just relax and keep the pace steady, not be tempted to weave in and out. We saw some of the runners from the Mind Over Marathon programme and wished them luck. I laughed at the very tongue-in-cheek booing when the three separate starts converged at 3 miles and at some of the costumes, but otherwise tried to keep “in the zone”, focussed and calm. It was getting hot though and I needed water much earlier than I expected to, fortunately the water stations are about once every mile. We passed Cutty Sark but I was keeping my head down, and the pace was good but it felt harder than I thought it should. At about 10 miles Collette told me she was struggling with the pace and encouraged me to carry on without her. She’s such a tough runner much stronger than me on her day, but I also knew a lot of what she has been through physically recently and so reluctantly I carried on alone. There really isn’t a quiet part of the London course but it still comes as a surprise when you reach Tower Bridge at halfway and all of a sudden you’re surrounded by the amazing sounds and sights of all the charity cheer points and then a bus blaring out music. I began to really enjoy myself, although it was warmer than I would have liked. I can’t remember the exact order of things over the next few miles but I saw Pete, Emma, Mike, John, Sharon and Simon and then Linda on her way back… I was looking out for my friends and apparently they saw me four times but I saw them just once, as I was leaving Canary Wharf. It gives you a little lift every time you see someone you know and when a stranger calls out your name. I was starting to get confused about the miles but pleased that the sun disappeared behind the odd cloud or building for stretches at a time. Now my head is rocking backwards and it hurts, I tip it forward trying to maintain some semblance of form. I stop looking at my watch. I’m recognising things but I don’t know where I am, or how far there is to go. Then there’s a kilometre to go and I look at my watch (was there a 25 mile sign, I didn’t see it? )… I can get a PB if I can just hold on. I’m coming up to Buckingham Palace, I can see the finish! My neck hurts, my foot hurts, I’m nearly there but the clock says 4:06 and something… was it three minutes after ten that I started? The PB will be tight, there could be seconds in it… and then I’m there and I don’t care about the time just finishing! I crossed the line with my arms aloft (nope I don’t think I’ve ever done that before!) My Garmin says it’s a PB and I’m over the moon. A medal is hung round my neck and I see Mary Ross from parkrun. She’s just missed out on sub-4 hours and can barely walk. Somehow I bend to undo my lace, my foot really hurts. The medal feels so heavy and my neck is sore at the front and the back. 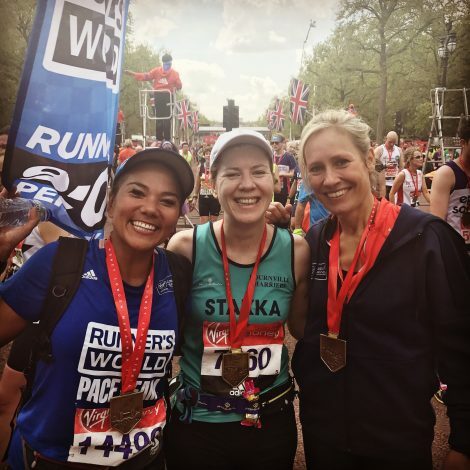 Then I bump into Sophie Raworth “off-the-telly”, a great runner who has got under 3:30 and her friend, the ultra-runner Susie Chan, who has somehow paced the 4-hour bus a couple of weeks after doing Marathon des Sables! They are kind enough to have a picture with me. Switching my phone on there are so many notifications. I call Guy and my Mom to let them know I did it, the emotion welling up and out. 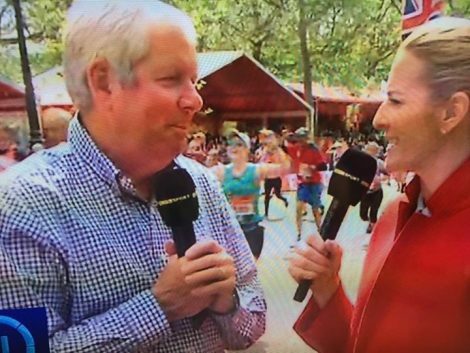 Somehow I make my way to the pub, where my mates have got the bubbles in and a pint of bitter shandy, which Brendan Foster recommends for recovery… and speaking of Brendan Foster, I then find out I’ve been on the telly, crossing the line just behind him and Gabby Logan! Catching up with the rest of Team Teal I’m pleased that everyone is back safely. There are mixed emotions; hugs for some and high-fives for others. Jude has totally smashed her PB by 7 minutes. Those that have already done one marathon this season amaze us all. The stories are flowing and we can barely walk but we all did it. There’s definitely something special about London; it’s hard, but it’s glorious and people who have never taken an interest in your running before are suddenly impressed and ask to see your medal. You watch it back on TV and remember things, or hear those stories – the elite runners, the club runners who become stars for their performance or for their sportsmanship, the fundraising, the celebs, the runners who are still going after 7 hours. The city comes alive and makes you proud to be a part of it. So I’ll be back in the ballot again this year and will have everything crossed for another London experience, I hope you’ll be joining me! This entry was posted in Marathon, Race Reports by BvH Admin. Bookmark the permalink. Fab report… serves as an extra motivator for everyone (myself included) that is thinking of running (or re-running) a marathon.. Congratulations! What a great story! As things were falling apart and the pacers overtook you I got scared that you weren’t going to make it – such a superb happy ending that I shed a tear or two… Well done and thank you, you are an inspiration to us lesser mortals. I thought that you were 27 years old Stacey. Makes your London Marathon time even more impressive! Well done Stacey! And all the other runners from BvH. Great report! 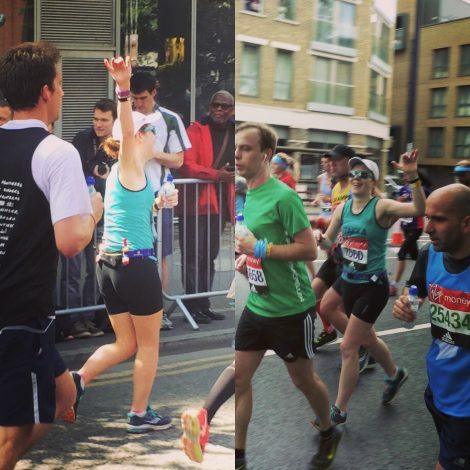 Thankyou Stacey for your London Marathon,2017 Race Report. Some splendid performances. Great to see Caroline Harlan-Marks racing again. It`s 20years since I ran in the London Marathon.I don’t think that I could keep up with the 11 BvHers who successfully competed in this years London Marathon! Great report Stacey. If someone was only ever going to run on Marathon then they should consider London as the one. The organisation is almost military, one example is that when I was walking down from the finish having collected my medal and goodie bag in a complete daze, you find yourself along side the baggage lorries (yes, something like 50 full size lorries have magically transported all the bags across London) and you start to work out which one your bag might be in. Checking you own number on your vest you finally start to sort of work it out and as you get closer you realise that there is already a volunteer there with you bag with a massive smile. They don’t even expect you to have to think at the end!